The Super Bowl can be a tough, boring time for those of us who have no interest in sports. For cat lovers, however, there’s an amazing alternative that’s sure to fill the hours of football that the rest of the country can’t resist. Hallmark Channel just wrapped filming on Kitten Bowl III, which will air on February 7th, 2016. The Kitten Bowl is a response to both the Super Bowl and Animal Planet’s annual Puppy Bowl. 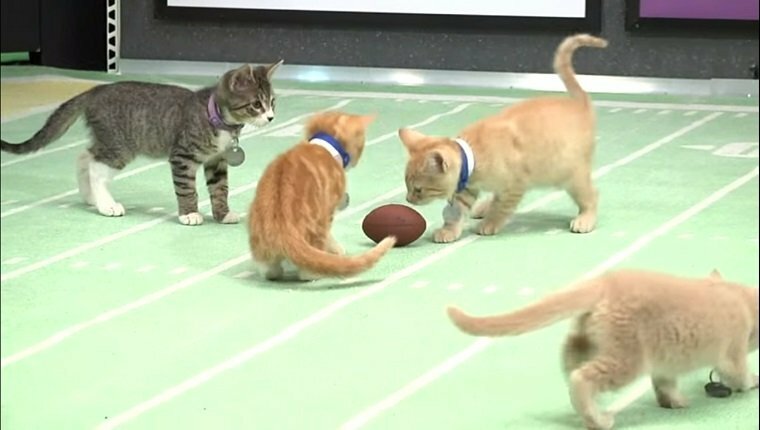 This year, the big game features 100 rescue kittens from North Shore Animal League America playing on a tiny field with a ball on a string, perfect for kitty fun. The goal posts are even designed for cat paws and claws so the kittens have a scratching or climbing post should they need a distraction from the action. The three-hour cute fest had 1.3 million viewers last year, so it’s got a way to go to catch up with the actual Super Bowl. But it helps promote the North Shore Animal League America, and it is a chance for young, adoptable kittens to be socialized early and learn to get along with other animals. Plus, it’s the most adorable three hours of television all year! Will you be tuning in? Let us know in the comments below.